I began playing the slide guitar in about 1971, when I was twenty years old. I played in rock bands and had listened to all the music of The Beatles and Rolling Stones and others. The sound of the slide guitar had always intrigued me, and I took up the "bottle-neck" where you put a metal tube on a finger to glide over the strings, mainly to play blues music. I later developed an interest in bluegrass, which led me to the lap style of playing the guitar, setting the guitar in a horizontal position and playing with a steel bar. Once the great Mike Auldridge put out his first record, playing an instrument called the Dobro, I knew I had to play in this style. I started doing gigs with The Lost World String Band, which became quite popular. We even played in Europe and Lincoln Center in New York. I started to really delve into the history of the blues, bluegrass and Americana music, and started to listen to the Hawaiian music of the 1920s and 30s. This was the fast bluesy and swinging style of playing by Sol Hopi and others. One day in the mid 1980s I received a call from a man who claimed he was writing a book about the Hawaiian guitar. He asked if I knew that the inventor of the Hawaiian guitar was buried in Dover, NJ! I was interested in this tidbit of information but did not tell too many others except a few friends and other musicians. I knew from books and articles that a man named Joseph Kekuku had invented the slide guitar style. Kekuku was born in the Hawaiian Islands in 1874. The story has it that he was fooling with a guitar on a railroad track and found a bolt, somehow slid it on the strings of the guitar, and it produced a unique sound. He started practicing and had the shop at his school make him a steel bar to slide over the strings. Today, any guitar played with this object is considered a "steel guitar", whether the instrument is made of metal or wood. Joseph studied the classical style of music and put his knowledge to the new Hawaiian guitar. This way of playing really caught on, and Kekuku became a sensation! He left Hawaii in 1904 for the U.S where he taught many people his way of playing. He later toured Europe, playing for kings and queens, London's Hippodrome, The Café De Paris, and radio stations all over the Continent. Kekuku returned to the USA in 1927/28 and moved to Chicago. While touring the country's vaudeville venues, he performed at The Baker Theater in Dover. He met a woman there and decided to settle on Mount Hope Avenue, and later at 88 Prospect Street. I knew a Mr. Fred Sharpe, a bluegrass bass player who lived in Dover his whole life. He told me Mr. Kekuku lived next to him and as a ten-year-old boy, Fred used to watch him play a National steel, a metal guitar with fancy engraving. Sadly, Joseph Kekuku never returned to Hawaii. He died in 1932 at Dover General Hospital, suffering a brain hemorrhage at age 58. His wife said it was from writing so much music. "He gave his life for the music he loved," she said. 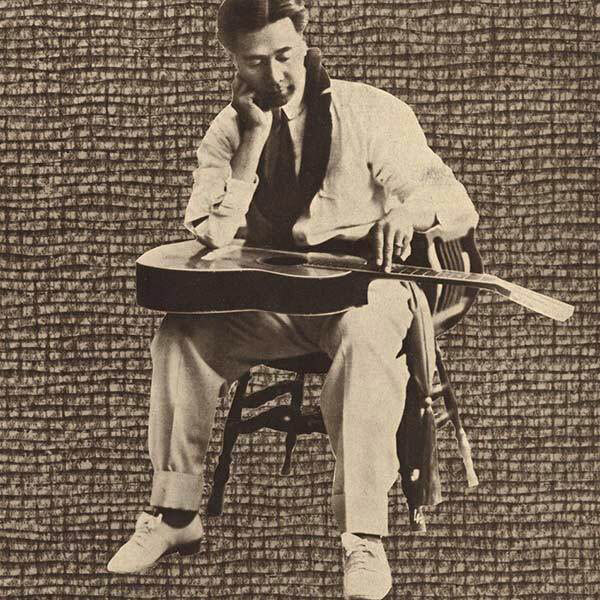 From its simple beginnings, Kekuku's Hawaiian guitar influenced the music of the islands, country, blues, rock, bluegrass, and modern day contemporary music. Country music used the steel guitar, and blues used the slide guitar, which the bluesmen imitated when they saw the Hawaiians play. Duane Allman set the standard for rock slide guitar, bringing the sound to millions more listeners. Today's bluegrass Dobro players play in the same style Kekuku invented. 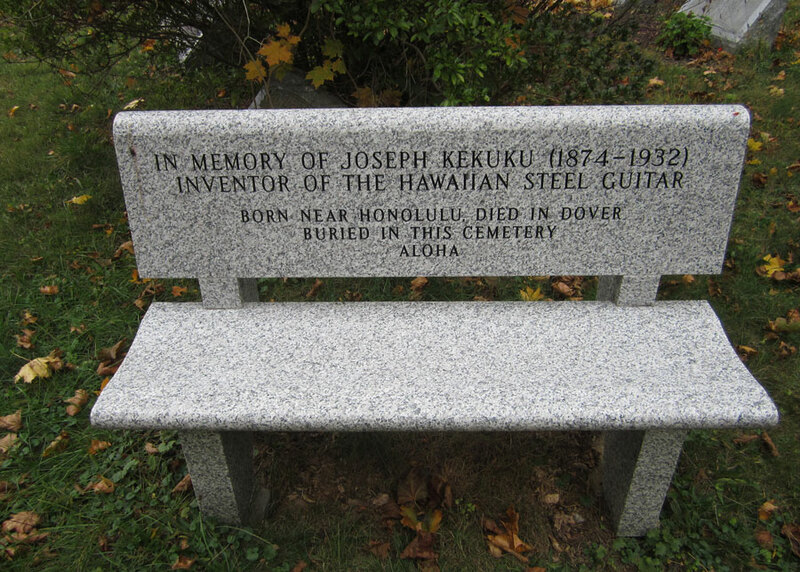 One day I told my friend, Tom Barth, who owned the Music Box In Dover, about Kekuku's grave. He said I should tell the Dover Historic Society. I got in touch with George Laurie who was very dedicated to Dover's history. He went to the cemetery on Orchard Street to look for the gravesite to no avail. Three times the historical society looked and could not find it. I thought maybe I was misled. Mike Esposito at Kekuku's grave in Dover. Finally they found it; the small tombstone was hidden under an overgrown bush! I told George that this man Kekuku made a giant contribution to music, and maybe we could put on some shows to raise money for a much bigger and better headstone he deserves. We did put on some wonderful, entertaining, and educational shows in Dover to raise money. I got players from all over the country to come at their own expense; they knew they owed this man lot. It is a dream of mine to give this man the headstone he deserves. I am blessed to have taken up this style of playing. I have met and played with many of the greats in blues, rock and bluegrass. Hundreds of TV shows use my slide guitar recordings, and I appear on more than thirty records, including five CD's of my own. 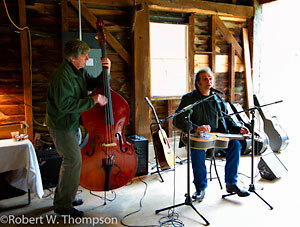 I continue to play many shows using my Dobro and National Steel guitars. It has been a great ride for me and I thank Joseph Kekuku for his invention. Learn more about Mike Esposito at his website.